This Amazon Prime Day, find unbeatable prices on stargazing binoculars for the space cadet in your life. Among countless other exclusive deals, Amazon is offering a few pairs of binoculars like the Celestron's EclipSmart 10x25 Solar Binoculars for sun observing, as well as other binoculars for night sky viewing, birdwatching or just taking in Earth's outdoor sights. Our top pick, though, are Celestron's solar eclipse binoculars. Celestron EclipSmart 10x25 Solar Binoculars: If you're one of the millions of Americans who will be watching the total solar eclipse on Aug. 21, check out Celestron's EclipSmart 10x25 solar binoculars. The binoculars are on sale at 10:45 a.m. EDT (1445 GMT), and will be marked down from $35 on Amazon.com. You can see Space.com's complete Prime Day Space Deal Picks here throughout today's sale events. Celestron SkyMaster DX 8x56 binoculars: These medium-size binoculars are on sale for $144.57. That's 28% off their normal price of $200.28 on Amazon! The deal expires at 12:45 p.m. EDT (1645 GMT) or when it is 100% claimed. 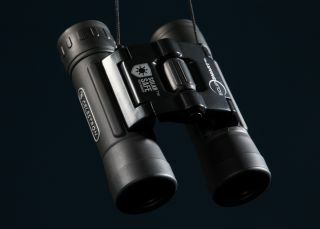 The Celestron SkyMaster 8x56 binoculars for both stargazing, as well as daytime outdoor activities like birding, boating or even watching your favorite sports team from the bleachers. In fact, we picked the Celestron SkyMaster 8x56 binoculars as our best pick for medium-size astronomy binoculars when we reviewed them. Kidzlane 8x21 Binoculars For Kids: For the young stargazer or outdoor enthusiast in your life, Amazon has two great deals for junior binoculars. Kidzlane is will have a sale on a pair of kids' 8x21 binoculars. These normally sell for $22 on Amazon. Check in at 9:40 a.m. EDT (1340 GMT) to find out what the sale price will be. Luwint 8x21 Kids Binoculars: Another pair of 8x21 kids' binoculars by Luwint will go on sale at 10:45 a.m. EDT (1445 GMT). Like the Kidzlane binoculars, these are compact and durable, making them ideal for adventures like birdwatching, gazing at the scenery, or looking up at the night sky. Luwint's binoculars normally sell for $18 on Amazon. Stay tuned for the new sale price. These deals will only be available to Amazon Prime members on Tuesday, July 11.